Quickest & easiest way to view extensibility logs! Save yourself the hassle of trying to remember where the various extensibility-related log files are located. Once you've managed to find the file you're looking for, you still have to manually load it in your text editor of choice. For those people who prefer their commands front-and-center, available all all times with a single click, this extension adds a new toolbar to hold Extensibility Logs's commands. For those people who don't want to add yet another toolbar, this extension also adds a new Extensibility Logs menu to the View menu. 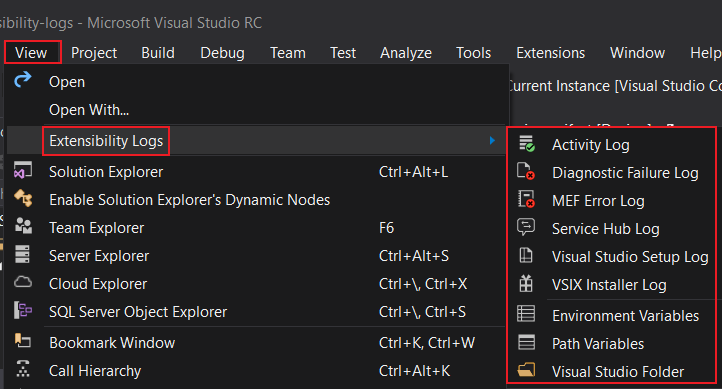 Extensibility Logs gives you a one-click experience (on the toolbar), or a three-click experience (on the menu), to open the desired log file in a document tab in Visual Studio.